GLOCESTER – Utility-sized solar arrays in Glocester will need a front yard setback longer than a football field, with shorter 300-foot side and rear setbacks after the Town Council approved amendments to the zoning ordinance. During a Town Council meeting last Thursday, Nov. 1, the coun- cil unanimously approved several amendments recommended by Town Planner Karen Scott to the Solar Energy Systems Zoning Ordinance in the Glocester Code of Ordinance. Utility-scale solar energy sys- tems, or arrays covering more than 200,000 square feet, will need a front setback of 500 square feet, and side and rear setbacks of 300 feet. Focusing on setbacks, the council adjusted the original recommenda- tion of a 400-foot front, rear and side setback for medium-scale and large-scale ground-mounted energy systems to 300 feet. Medium-scale arrays are larger than 1,750 square feet, but not larger than 40,000 square feet, and large- scale arrays are between 40,000 and 200,000 square feet. Setbacks for medium- and large-scale arrays were previously set to 200 feet. Council member Walter M. O. Steere III said the purpose of the changes is to stop the "gold rush"-like effect of companies buying farmland in Glocester to set up solar fields. "At the end of the day, we need to balance property rights and keep- ing the rural character of the town," Steere said. The council's decision was met with mixed reviews, with some residents praising the ordinance for preserving the town's rural character, ad others admonishing the restrictive changes. Marjorie Swift, a Glocester resident, said the setbacks would make solar systems unfeasible for Glocester resi- dents. She and her husband, Stacey, plan to put a solar array on their land on Hartford Pike. "I don't think one size necessarily fits all. I don't think we should hurry any of these approvals. Be conser- vative about this and take it easy," Stacey said. Planning Board Chairman George Charette, who spoke as both a resi- dent and public official, said the push to move "solar farms" onto farmland is dangerous. "They want you to allow them to use those (farming) fields. If you lose the farm industry, what are you going to eat?" Charette asked. "It's been ruled they're not farms, it's manufacturing," he added. Charette said the prior ordinance was weak, and deciding each devel- opment on a case-by-case basis using the comprehensive plan left the rules open to interpretation. "I've said for the past 20 years, you better start making changes, because it's going to bite you. We're there," Charette said. Council member Patricia Henry said taxpayers of Glocester should decide what is best for the town by putting restrictions on solar. "It's important that we do not lose sight of our town's character, if that means a few big projects are killed. We're not going to please every- body," Henry said. No changes were made to zoning districts for small, medium and large solar arrays. Only small-scale arrays are allowed in the village district, while medium-scale systems are per- mitted in all other zoning districts. Large-scale solar projects are allowed by special use permit only. In addition to the setback adjust- ments, the council approved several other amendments to the ordinance: • Remove restriction of solar arrays on prime agricultural soil, or soil of statewide importance by the U.S. Department of Agriculture and Natural Resource Conservation Service; • Allow utility arrays in A-3 and A-4 agriculture residential zoning by special use permit; • Allow utility arrays adjacent to but not in R-2 zoning; • Require screening be maintained by owner for the life of system; • And increase the maximum amount of clearing permitted of for- ested property to 30 percent from 20 percent. 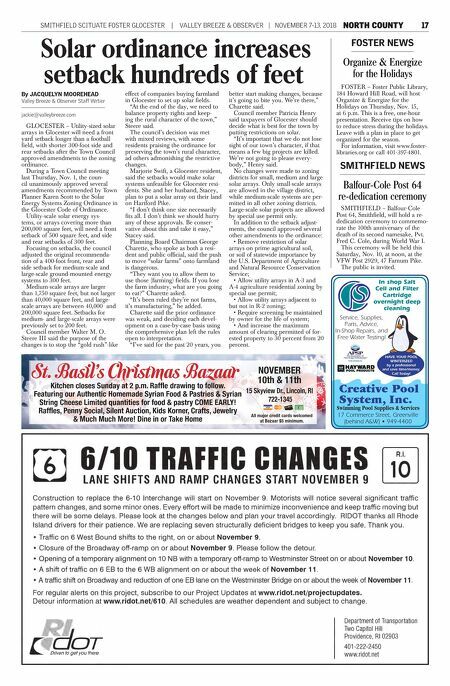 SMITHFIELD SCITUATE FOSTER GLOCESTER | VALLEY BREEZE & OBSERVER | NOVEMBER 7-13, 2018 NORTH COUNTY 17 Solar ordinance increases setback hundreds of feet By JACQUELYN MOOREHEAD Valley Breeze & Observer Staff Wrtier jackie@valleybreeze.com Organize & Energize for the Holidays FOSTER – Foster Public Library, 184 Howard Hill Road, will host Organize & Energize for the Holidays on Thursday, Nov. 15, at 6 p.m. This is a free, one-hour presentation. Receive tips on how to reduce stress during the holidays. Leave with a plan in place to get organized for the season. For information, visit www.foster- libraries.org or call 401-397-4801. FOSTER NEWS SMITHFIELD NEWS Balfour-Cole Post 64 re-dedication ceremony SMITHFIELD – Balfour-Cole Post 64, Smithfield, will hold a re- dedication ceremony to commemo- rate the 100th anniversary of the death of its second namesake, Pvt. Fred C. Cole, during World War I. 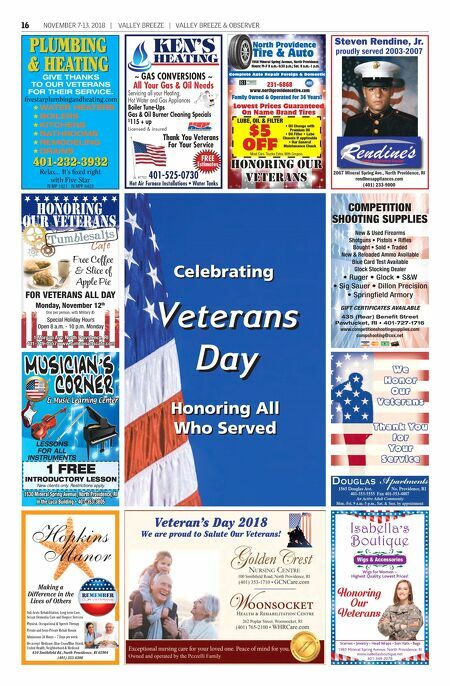 This ceremony will be held this Saturday, Nov. 10, at noon, at the VFW Post 2929, 47 Farnum Pike. The public is invited. St. Basil's Christmas Bazaar NOVEMBER 10th & 11th 15 Skyview Dr., Lincoln, RI 722-1345 All major credit cards welcomed at Bazaar $5 minimum. Kitchen closes Sunday at 2 p.m. Raffle drawing to follow. Featuring our Authentic Homemade Syrian Food & Pastries & Syrian String Cheese Limited quantities for food & pastry COME EARLY! Raffles, Penny Social, Silent Auction, Kids Korner, Crafts, Jewelry & Much Much More! Dine in or Take Home Creative Pool System, Inc. Swimming Pool Supplies & Services 17 Commerce Street, Greenville (behind A&W) • 949-4400 In shop Salt Cell and Filter Cartridge overnight deep cleaning Service, Supplies, Parts, Advice, In-Shop Repairs, and Free Water Testing! HAVE YOUR POOL WINTERIZED by a professional and save time/money. Call Today!